We have all heard the old saying "Something old, something new, something borrowed, and something blue." Did you know that the color blue represents fidelity, which is why it is associated with weddings? Whether you want just a hint of blue or a completely blue themed wedding, there are many great ways to use the color blue in your wedding. Blue is a terrific color to use in a wedding. It comes in many different shades, from classic navy to feminine baby blue, to famous Tiffany blue. Even the most pastel shade of blue is going to be more acceptable to most grooms than a color like pink or lilac, which is a plus. In addition, blue can be combined with other colors to create an entirely different effect. In keeping with the old saying, most brides will want a hint of blue somewhere in their wedding outfits. It can be as subtle as a blue flower on the garter, or as prominent as a blue sash around the waist of the wedding gown. Many brides will decide to get their "something blue" in their wedding jewelry. You often see a little blue Swarovski crystal mixed in with a pearl to make a lovely drop earring. Of course, you can always do what I did and paint your toenails blue (I did wear closed toed shoes)! Blue is an immensely popular choice for bridesmaid dresses because it is universally flattering. You can set a very different tone by the shade of blue that you choose, especially when you mix it with another color. For example, a strapless blue dress with a chocolate brown trim would be the height of sophistication. Navy will be traditional, and with white trim takes on a fresh, nautical appeal. Blue and green together can be great for a wedding by the ocean. Often brides will decide to give their attendants bridesmaid jewelry handmade with blue crystals to match the dresses. Blue is a great choice for bridesmaid jewelry because they will easily be able to wear it again after the wedding. Most women have a lot of blue in their wardrobes, so the pieces will mix in quite easily. Blue crystal earrings also look terrific with a great pair of jeans and a cute top for an evening out. You cannot go wrong with blue decorations for your reception. 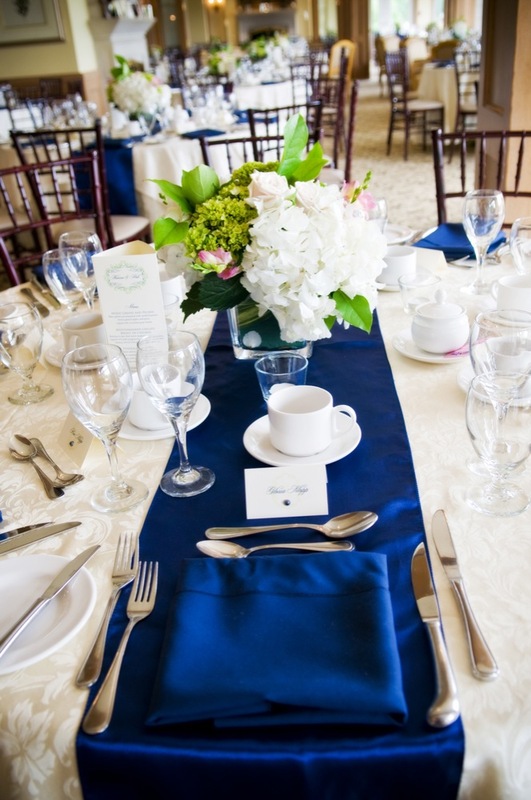 Table cloths look very pretty in blue, and it is also a color that will not feel overwhelming in a large quantity. The one thing that is hard to come by is blue flowers. At certain times of the year, you can get the blue hydrangeas for which Nantucket is famous, but they can be every expensive. Besides, there is such a thing as too much of a good thing. If you have chosen blue linens, you can choose a flower in an accent color instead of trying to get blue flowers. White is always pretty for a fresh look with any shade of blue. Pastel blue would look very nice combined with any other pastel flowers, such as pale pink or lavender. 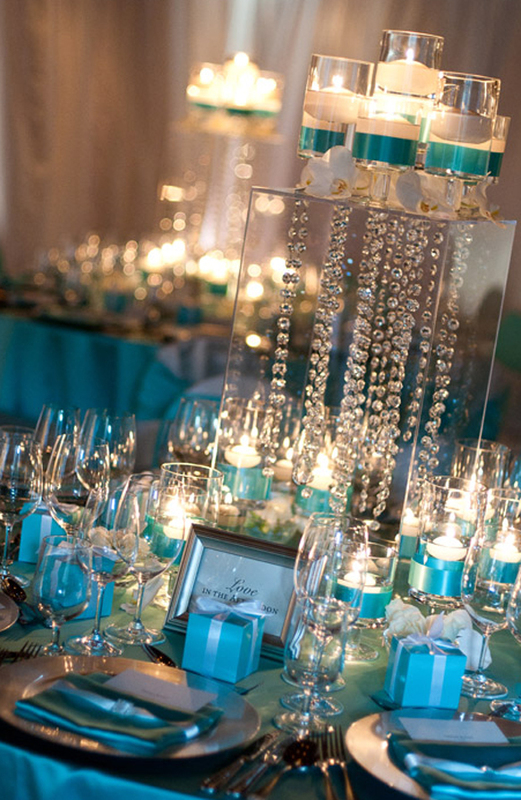 For a bright pop of color, pair red flowers with a Tiffany blue color scheme. Just be careful when combining red and navy, as it can end up looking more like a party for the Fourth of July than a wedding. Blue is the most versatile color. It works beautifully for a wedding because there are so many ways in which it can be used. When planning your wedding attire and décor, remember to include your "something blue".